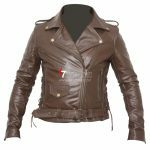 Brown Leather Pistol Pete Motorcycle Jacket with Zippered Vents is especially designed for professional bikers to fulfill their biking passion on track with great safety. This Jacket features excellent design, Protection & comfort, genuine leather, Approved internal & external Protectors on Shoulder, Elbows and Back, YKK Zippers for Performance. Full ventilated Chest to keep the biker cool while riding. Soft Naked Touch Cowhide 1.1-1.3mm Leather. Covered metal zippers give more sturdy and cleaner look. Dual full length utility pockets, two additional front pockets, & two inside pockets for ultimate storage possibilities.